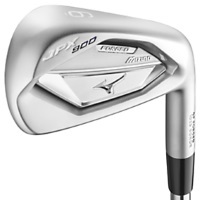 Built on the foundation of Mizuno's first integration of Boron, the JPX 900 Forged makes 'across the board' enhancements that improve the look, feel and distance, with new levels of ball speeds from a forged iron. Delivering on ball speed and forgiveness, with a more compact playable design, the 900 forged provides the ultimate balanced attack. 1025 Boron is roughly 30% stronger than 1025E, allowing thinner, hotter, more extreme geometry. Increased strength of Boron material frees up discretionary weight to be more optimally used.